My note: Skittles are gluten-free (Yesss!) check your bag, it should say gluten-free right after the ingredients. Also, most of your basic alcohols (vodka, rum, brandy, gin, tequila) are all gluten-free because of the distillation. If you are not sure, check the brand’s website. Yes, even those that are made from wheat! Enjoy, but don’t forget to drink responsibly! Separate all the skittles by color. Pour 6 of the mini bottles of vodka into one of the empty containers. Save the mini bottles. Add 120-150 red skittles. Repeat this with all the colors. 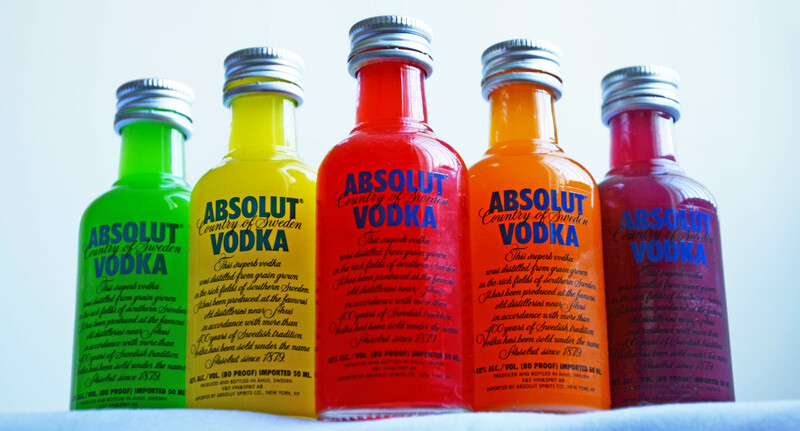 You should have 5 containers with skittles of different colors in vodka at the end. Stir each container. Cover each container and set aside for at least 24 hours or until the skittles are dissolved. Shaking or stirring occasionally helps. Once dissolved, get out about 4 coffee filters and pour a portion of one color through the filters into an empty cup. Once the flow rate slows down, squeeze the liquid through like how your supposed to squeeze a toothpaste bottle (back to tip). If there is still white gelatin floating, filter again. Continue this until there is minimal gelatin floating in the vodka. If your friends are like mine, they won’t care about a little bit left. I found that the white gelatin stands out most in the green and purple so I filter these twice. Repeat this until you have filtered all of one color. Use the funnel or your pouring skills to pour the vodka back into the mini bottles. Repeat this for each color. Depending on how many filters you used and how many times you filtered, you may not end up with as many mini bottles full as you started. You can fill the mini bottles that are only part full using more vodka if you want or just have extra mini bottles for other uses. You should end up with about 5 or 6 bottles of each color. Use as party favors for New Year’s or any other adult party. Enjoy! Holly’s update: Mix the orange skittles vodka with cranberry juice. It’s magical. And when you’re done with that, mix the yellow skittles vodka with lime margarita mix. Delicious. Thank you Holly at http://www.hollyshelpings.com for such an awesome recipe!